Scott Snyder and Greg Capullo's magnum opus Dark Nights: Metal has been absolutely insane, in the best possible ways. It's had threats from the newly discovered Dark Multiverse, the Justice League fighting alien gladiator monsters in a giant mech, and Batman riding a dinosaur. Truly, everything anybody could ever want in a comic book. As Metal wraps up later this month, DC Comics have already begun releasing new series and ideas that spin out of the miniseries. Dubbed "The New Age of DC Heroes," this movement has paved the way for new characters like Damage, the Silencer, and Sideways, as well as new homes for familiar characters like the cast of the Terrifics. One of the books yet to come is The Unexpected, from artist Ryan Sook and writer Steve Orlando. Described by Orlando as "Seven Samurai meets The Dark Tower," the book will see characters with absolutely amazing names like Viking Judge and Neon the Unknown come together to ward off threats to the Multiverse. 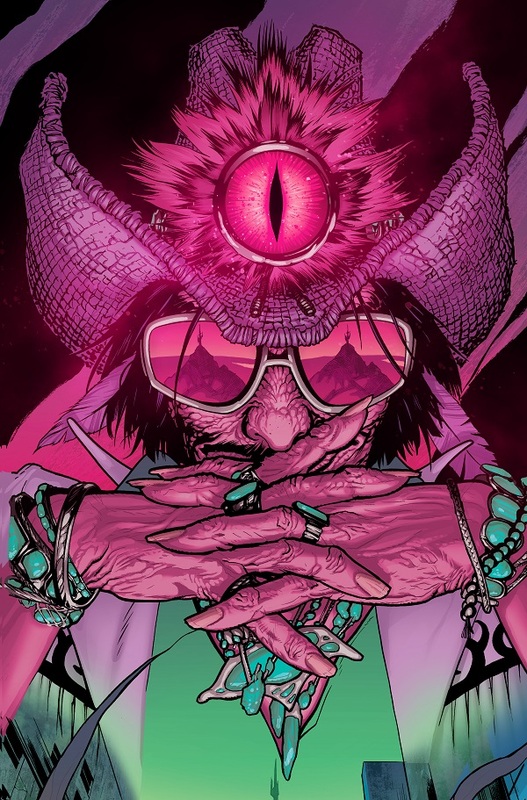 Head on over to the DC Blog for an interview with Orlando and Sook as well as some of Sook's concept art, including an upper cover for the first issue with a character who looks, no joke, like Macho Man Randy Savage if he were a dinosaur. And also with the Eye of Sauron in his head. The Unexpected will hit comic shops and digital retailers in June.